Luxury detached 3 bed villa enclosed in a large garden with private pool in a quiet area of Calis. 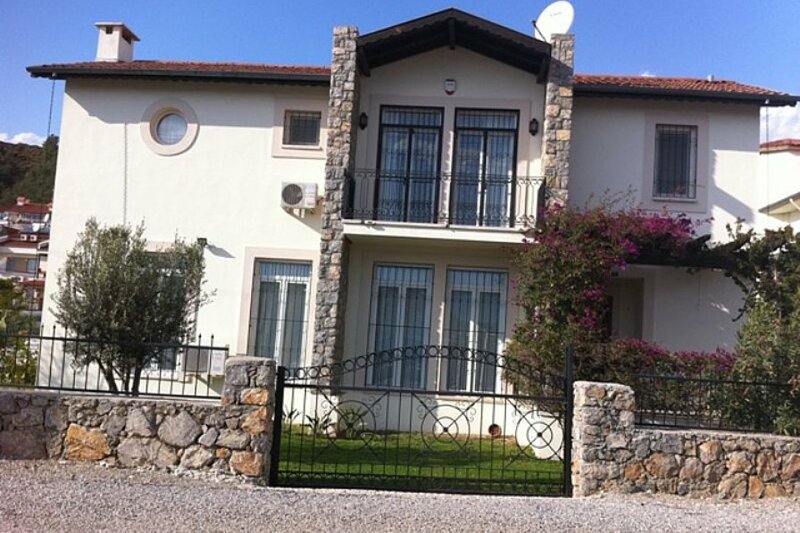 This luxury 3 bed detached villa is fully furnished and located in a quiet area of Calis. It is located left, off the main street called Baris Manco Blv, past the upside down bridge in Calis. Downstairs is a large living area with comfy sofas, bean cushions, coffee table, TV/DVD player, CD/radio player, leading onto a large terrace/patio overlooking the private pool. The kitchen is off the living area and fully furnished including a dishwasher. The washing machine is located in the utility room downstairs. There is also a downstairs WC/shower room. There is a dining table and chairs for inside dining. There is also a safe in the villa, plus mosquito screens on all bathrooms and bedrooms. Upstairs are 3 double bedrooms all ensuite, although one of the bedrooms can be a twin if you prefer. The garden is very large and includes a private swimming pool. There are 6 sunbeds with mattresses and a large umbrella for around the pool. Nearby is a local shop for basic supplies. The local bus stops near the villa. Or you can walk to the beach at Calis and promenade, which will take you around 20-25 minutes. It is a pleasant walk by the canal. Calis Beach is suitable for everyone with a sandy and shingle beach. It is quiet and peaceful with a good selection of waterfront bars, cafes and restaurants. Also the perfect place to watch one of the spectacular Calis Sunsets with a cold drink in hand! Calis also has a waterpark! Enjoy the weekly Sunday market in Calis and grab a bargain (remember to haggle)! Nearby, along the promenade is a water sports centre where you can hire or have instruction in windsurfing, kitesurfing and sailing.